Militants failed to shoot down President Musharraf’s plane today as it was taking off from an Islamabad military base. Shots were fired after President Gen. Pervez Musharraf’s plane took off from a military base on Friday in what one official described as a failed assassination attempt. Security forces quickly surrounded a house in Rawalpindi, a garrison city south of the capital. 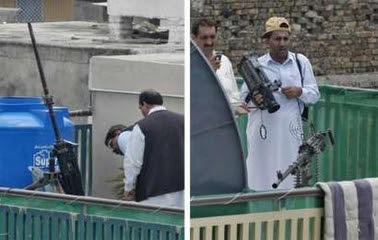 Three other officials told the AP that two anti-aircraft guns and a light machine gun were found on the rooftop. The senior security official said Musharraf was aboard the plane at the time, although he insisted that the president was not within the range of the attackers’ weapons. Television footage from an overlooking building showed a large gun pointed skyward next to a satellite dish as security officials rushed around. It was unclear if the gun had been fired. This is not the first attempt on President Musharraf’s life. Reuters has A LIST of previous assassination attempts on Musharraf. Pakistani military spokesman Major Gen. Waheed Arshad denied the shots were fired at Musharraf’s plane. 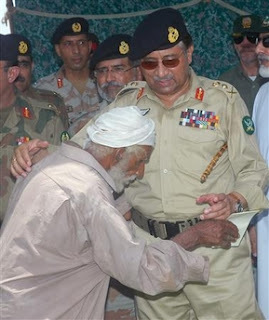 The attack did not appear to slow down Musharraf as he was seen hours later comforting flood victims in Turbat, Pakistan.